After publishing a recent beerography, I made a post in the St. Louis beer subreddit asking if there were other St. Louis beers that deserved some Drink314 love. 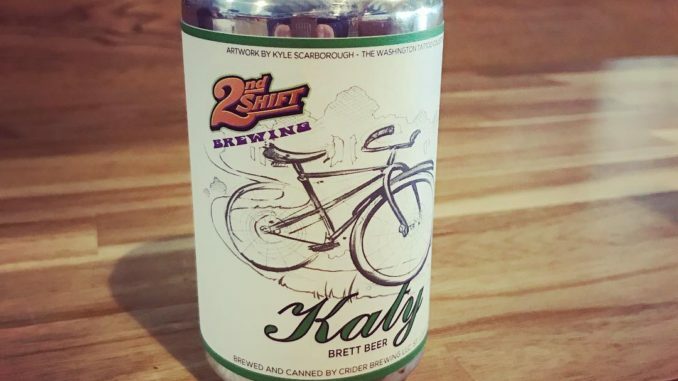 One of the beers that got mentioned is one I regard highly, Katy from 2nd Shift Brewing Company. Katy was the beer that introduced me to 2nd Shift, back in late 2013, when they were based in New Haven, Missouri. Their reputation proceeded them, as I had been looking to try their beers here in St. Louis, but had no luck until I found Katy at a house beer tasting event for Pedal The Cause. At the time, I remember being intrigued by Katy, as I had really not tasted anything quite like it. Today, nearly 5 years later, Katy is among those beers that are mentioned when ever 2nd Shift becomes part of a beer conversation. One of the questions asked on the Reddit post was why Katy has been harder to find, at least since the brewery located to St. Louis? The answer is twofold. When they moved from New Haven, their barrels got trashed. They basically had to start over. They began using Foeder Crafter foeders and because those take a bit of time to develop it’s been taking a bit to get it back into market. Slowly but surely more Katy is getting back into the market. Multiple cases hit the local area the last couple of weeks, available in 12 oz. 4 pack cans. To learn more about this St. Louis classic, I reached out to Libby Crider, co-owner at 2nd Shift. What inspired the creation of Katy? What makes this beer unique or stand out from others like it? Honestly, I’m not quite sure. We try to not mess with this beer too much – it spends a week to two fermenting in stainless, and is then transferred into wood with a pitch of Brettanomyces Lambicus. And we just let it do its thing until its time to blend – 3 to 6 months later. Why do you think the public has taken such a liking to this beer? It seems to appeal to a very broad array of beer & wine drinkers. It’s approachable & light, but tart & elegant at the same time. Can you tell me about the label art? On the pour, Katy is golden in color, slightly hazy with a thick head that quickly disappears leaving nice lacing behind. On the nose, you’ll get a nice sampling of pineapple, apple, sour cherry, and funk. On the tongue, you get a light tropical flavor, stone fruit and citrus with a funky, slightly oak back. When you have a winner with a beer, you have two choices. You can either leave well enough alone, or you can try to expand on the success you’ve discovered. Crider and company have elected to innovate Katy, and along the way have created many successful variants.